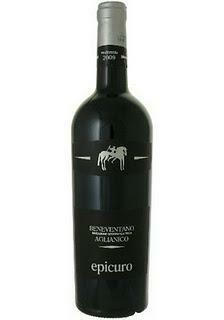 Drink: Epicuro Aglianico Del Beneventano 2009 | CookDrinkFeast! I picked up this inexpensive bottle of wine at Trader Joe’s in Newport News, VA. The description on the label and the low price point convinced me to give it a try. I was not disappointed. The nose gave the bouquet of toast, leather, and ripe cherries. It is smooth and velvety on the palate with some heft. I taste blackberry, plum, and cherry with a hint of spice. I definitely won this gamble. This wine tastes like it is well above its price point.